How can a shadow of an object not be formed ? Complete explanation on opaque, transparent and translucent objects. 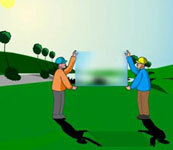 This physics animation (optics) software gives information about optical transparency and is useful for schools. Why is the shadow of a transparent glass pane not visible ? What are translucent & opaque objects? Can a man become invisible ? An invisible man has to be blind ! Why does a powdered glass becomes visible ? Are opaque things really opaque ? 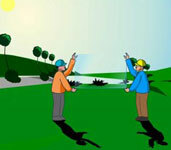 An opaque object does not allow the light rays to pass through it but a transparent object is one which allow to pass the light rays through it. So trasparent object like, glass can not cast a shadow. Translucent objects partially obstructs and partially allow light rays to mpass through them. So a ground glass produces a lighter shadow. Unclear about the concepts, please refer the animation below. Ans: When light strikes an interface between two substances, some of the light is reflected, some is absorbed, and the rest is transmitted. An opaque substance transmits very little light, and therefore reflects or absorbs most of it. Example a mirror, wall and blackboard. Opacity is the state of being impenetrable to light. An opaque object is neither transparent (allowing all light to pass through) nor translucent (allowing some light to pass through).